How many Christmas morning photos and Birthday party photos include a large trash bag of gift wrapping? Imagine how much that piles up with every home and birthday doing the same thing. Fabric wrapping can eliminate some of that waste. Watch the clearance racks, the remnant racks and other methods to obtain economical fabric, and you'll not only be saving the environment by making re-usable gift wrapping, but you'll also be investing in future savings. Gather your gift wrapping and save it from year to year or let the wrapping be part of the gift. Either way, the environment wins! These gift bags are sized to hold the most commonly used gift boxes and will meet all kinds of gift-giving needs. Don't forget to make some in "all-occasion" fabric, so you have them on hand for gift giving throughout the year. Sure you can give a bottle with just a ribbon around the neck of the bottle, but you can wrap it in a fabric gift bag to extend the anticipation and allow the recipient to have a gift they will re-gift when the bottle is empty. Tie the perfect bow to decorate clothing, a package or any bow need. Find free directions here. Tie a perfect bow for decorating clothing, packages, barrettes or other needs. This bow is a narrow but full bow. It works well on an oblong or rectangle package as well as on a barrette as a hair bow. You will need ribbon as wide as you want the finished bow. These directions walk you through using fabric scraps to create your ribbon to match any outfit. Dress up your canning jars with these simple to make fabric covers! Find full free directions here. Add a buttonhole, and you'll be giving a coin bank when the jar is empty. 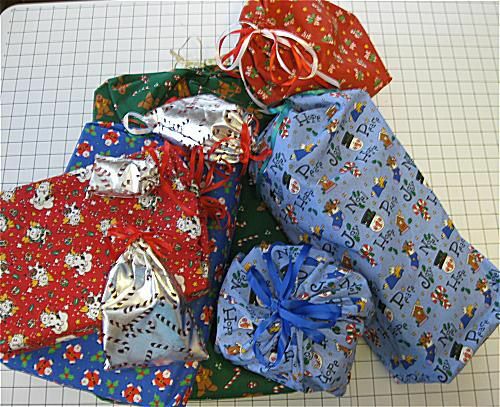 You can be very decorative wrapping with fabric. This page offers all kinds of ideas for all kinds of shaped packages. You'll be using up your fabric stash in no time.